Adaptable to almost any situation, MPIII Temperature Loggers measure less than an inch (without probe or Thermal Pack). Their small size increases versatility and precision by allowing you to position loggers very near or inside monitored items. From chilling, freezing and room temperature to pasteurization, EtO sterilization and depyrogenation, MPIII Temp, HiTemp and HiTemp EXT loggers provide accurate data over a wide range with remarkable ease. The Thermowell allows for addition/removal of the logger without breaking the seal! This logger is great for monitoring temperatures in a sealed container such as a can or bottle where it is critical that the seal not be broken during testing. The Thermowell can be welded directly into piping allowing the logger to be easily removed and replaced when desired without shutting down a process. Thermowell is a perfect fit for an SIP or CIP system at the typical monitor points. Made from the same durable materials you’ve come to expect from DataTrace, this MPIII logger is no different and has threads at the base of the probe to allow it to be easily attached and detached from the Thermowell at any time without breaking the seal! 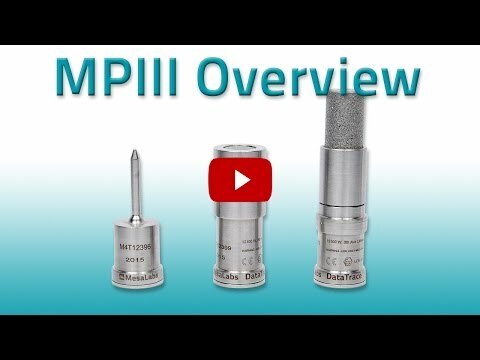 The MPIII Temperature Data Logger provides accurate data to help you optimize food, pharmaceutical and other manufacturing processes. The closer the sensor is to the product, the more valuable the collected data. That’s one reason the MPIII Temperature Data Logger is so small. Rather than mounting externally like most sensors, our wireless data logger easily fits inside a variety of packages, like an ethylene oxide ER pack during sterilization, to maximize accuracy and process validation. In addition, Mesa offers a wide variety of accessories to allow DataTrace® data loggers to be properly positioned into a variety of cans, pouches and other packaging materials and containers. And since it is wireless and operates at low voltage, it is intrinsically safe for hazardous environments. Part of DataTrace®‘s comprehensive solution, the wireless Micropack III Temperature Data Logger requires minimal training to use. Features like IR communication and batch programming and reading makes data collection fast and simple. MPIII is a single, integrated solution which can be extended to simplify data logging of an array of process parameters. At the heart of the solution is DataTrace®‘s intuitive and highly secure FDA 21CFR Part 11 compliant DataTrace Pro software. You can’t beat it for flexibility and ease. Create reports in any format you want. Save time and money with automatic downloads and graphs. Use password protected access, electronic signatures and automatic documentation for audit trails to streamline your work. Even synchronize multiple Data Loggers (in any combination of Data Logger types) to the same program. The Micropack III Temperature Data Logger’s small design and intuitive, easy-to-use software makes it easy to integrate into your process greatly improving your productivity. No temperature monitoring system gives you more flexibility.